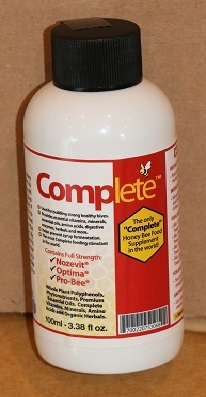 Home > Medications/Treatments > Complete Bee "Honeybee Food Supplement"
Complete Bee is an "All Natural whole plant polyphenol" bee food supplement with 15 natural essential oils combined with complete vitamins, minerals and amino acids. It contains Nozevit plus, Optima and Bee Cleanse. 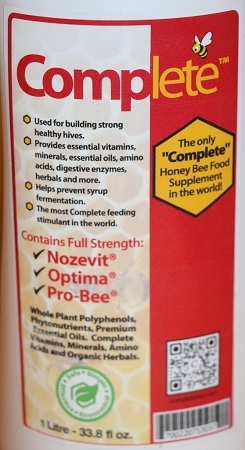 There are no HFCS or GMO's added as fillers and Complete Bee only uses organic ingredients. It can be used as a drench to help maintain honeybee intestinal integrity or used in sugar syrup being fed to the colony as a feeding stimulant. For drench use 4 tsp. in one quart of 1/1 syrup and drench 4 times, 4 days apart in spring and fall. For feeding, 1 tsp. per quart of syrup in feeder. We have two sizes available - 100 ml (3.380 oz) & 1 liter (33.8 oz). Excellent feed additive. I add it to sugar syrup regularly.